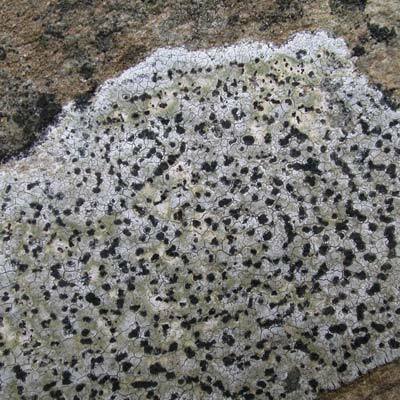 This ice-white to chalk-white crustose species with smooth thallus and black, non-frosted discs arranged in almost concentric rings outwards from the centre occurs on slightly basic, slightly acid rocks, a habitat referred to by lichenologists as ‘intermediate’. It has a scattered distribution in Ireland, both in urban and rural areas. 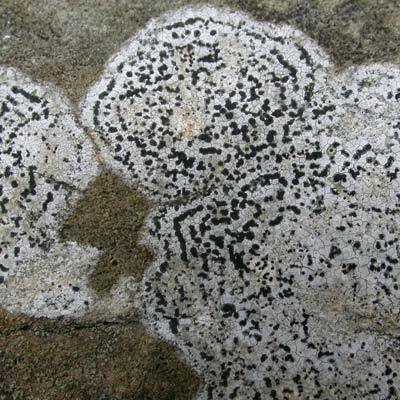 The similar Rhizocarpon umbilicatum, which also occurs in Ireland, has randomly distributed discs, a snowy-white thallus and is only found on quality limestones, never intermediate rocks. Simms, M. J., (2016). Rhizocarpon petraeum (Wulfen) A.Massal.. [In] LichenIreland.